These red, white and black sneakers are completely stuck in my head for few days. I really, really tried to get over them but couldn’t. Or wouldn’t! 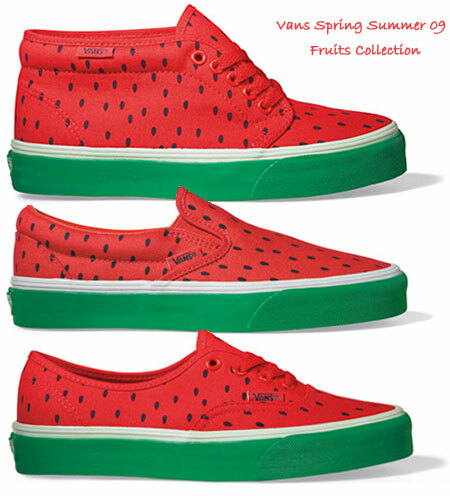 Because you had to know about it – the Fruits Collection for Vans Spring Summer 2009! They’re funny and cute and very summery. I can see them “go walking”. Kpriss what’s the colour of your pant suit? A great way to make a stiff office suit looks like fun. P.S. Kpriss, which pair of these Watermelons are the ones for you? I like the slip on Watermelon Vans! Adriana, I haven’t really thought about it seriously (because I got out of that corporate thing so long ago, it seems like ages, already!) but I guess I’ll be matching these with a dark brown (very large)pants suit! I think a gray one would be too much pain for the eyes. 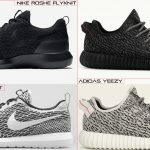 And also, I’d go for the high-top ones. So the pants would have a nice flow, with now low-cut restrains. where can i get them in canada? does anyone know where i can buy them in toronto? or atleast where i can order them? I want these so bad! My sister wants to buy them for me for my birthday next montha dn I wanna know where I can get them :) Thanks! 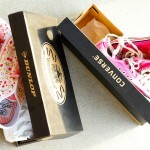 Roxy and Minna – the Vans Watermelon are available chez Solestruck!